Kotsekoto - Do you really need to Rush? Do you really need to Rush? It sure looks like a smaller version of the Fortuner too. However, that’s where the similarities end because this thing, despite the spiritual name, is armed with the same heart and gearbox of the Avanza. There’s 3 models and 3 price ranges, 2 of them are 5-seater only; the manual and automatic 5-seater cost PHP 948,000 and PHP 988,000 respectively. The most desirable – and most expensive model – costs PHP 1,070,000. An Avanza is much cheaper but all models are 5-seater only and costs PHP 891,000 for the cheapest and only PHP 1,065,000 for the highest end model. Pricewise, is it worth it? Yes and no. For the same amount of money, you can get most Avanzas and they both have the same amount of equipment as standard or optional. The only upside to the Rush is that it’s actually 0.5 inches taller than the base model 2018 Fortuner and it seats 7 people if you cough up the extra cash. But I must admit that rear seat space is quite limited and only suited for small kids. It does have superior wading capability compared to the Avanza so that’s also a plus. I’m having difficulty figuring out what’s wrong with this thing, folks. It’s got exactly the same engine and gearbox as well as similar interior creature comforts. It’s basically a bigger Avanza and I think you’re better off just getting the Avanza. 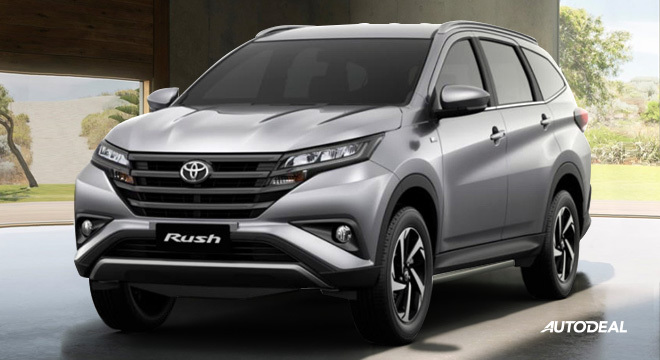 Unless you buy the 7-seater, the Rush isn’t something you should rush into. It’ll be incapable of rushing through the streets when it’s fully loaded with the 2-3-2 seating and all their luggage. So, if you want the high end models, take the Rush instead but if you want anything below 7 seats, take the Avanza.